The Koni STR.T (Street) Orange is Koni's entry level shock, but this is Koni we're talking about, so these are better than most companies' top of the line. 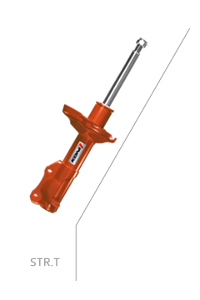 The STR.T orange shocks and struts take the engineering and performance knowledge gained from almost 100 years of shock absorber manufacturing and offers it in an affordable, easy to use shock. Available for select sports car, the STR.T Orange is specifically engineered to provide the best blend of performance and comfort for street cars. Koni STR.T Orange struts and shocks are specifically engineered to work with lowering springs. If you're lowering your car to improve its looks and performance, reusing your factory struts or shocks is one of the worst things you can do. Factory shocks are designed for comfortable driving at factory height, and many get unbearably stiff and provide little or no damping at lower heights with stiffer springs. If you've ever seen a lowered car bouncing down the highway like it's on a dirt road while every other car is cruising smoothly, you've seen perfect evidence of why you need specially designed shocks and struts to go with lowering springs. The Koni STR.T series is so reliable and well built that Koni stands behind it with a lifetime warranty against defects. In 40 years when your car is a classic, you'll still have warranty coverage for the Koni STR.T shocks and struts you buy today. Looking to lower your car? Koni STR.T Lowering Kits with high performance springs provide everything you need to lower your car, making it look better and handle like it's on rails. Want the best, no compromise, race ready shocks for your car? Koni Sport Yellow Adjustable Shocks and Struts give you a 100% range of adjustment for the most precise suspension tuning ever. Need great handling without sacrificing ride quality? Koni FSD Gold shocks and struts for luxury cars offer the performance and comfort of an electronic damper without the cost.